This is a guest blog by Matt Du Puy, principal software engineer at ARM in San Diego, California. The emergence of power-efficient technology and increase in outdoor activities has gone hand in hand. Got an activity tracker? Yup, you fit the bill. 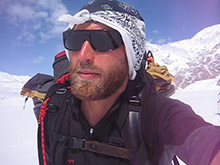 Matt, however, is taking it, quite literally, to the next level by climbing 8,000m Himalayan peaks such as Annapurna and Dhaulagiri. We thought it would be illuminating and interesting to follow his progress, both in terms of technology and exertion, on this great challenge. It could be because I was born in Southern California, near Disneyland, in the shadow of the Matterhorn rollercoaster ride. Or it could be because we spent our family summers camping out of a VW van while visiting national parks. Either way, I’ve steadily extended my love of travel and the intensity with which I pursue it - backpacking through Central America, hiking Kilimanjaro, skiing Mt. Whitney, the usual youthful outdoor diversions. But then came the big mountains. And here I am, 38 years deep in life, flying from San Diego to Nepal - probably in mid-air as you read this - to test the limits of human and technological capabilities doing one of the most dangerous “leisure” activities known to humanity. I’ve got Everest, K2 and others under my belt, so why Annapurna (26,545 feet) this time? Why Dhaulagiri (26,795 feet) on the same trip? Because there’s always the unrivaled feeling of achievement when you’ve summited, followed by the humbling realisation that you’re only halfway done with the trek; you still have to get down safely. And this trip is also about technology. I'm leaving the U.S. March 9, kitted out with a number of wearable and mobile devices along with food, gear and an extra 20 pounds on my frame, which I’ll lose in the 11 or so days we trek up Annapurna. I’ve been climbing big mountains for 10 years, but this trip I’ll be using more (and cooler) electronics than before; devices that will keep track of my health, the weather, pace and location, capture moments, and send dispatches of our travels. I wanted to use the journey to use and observe how technology aids or even changes the nature of climbing. Most of these are ARM-powered in some way, which is fitting for an engineer who’s worked for ARM for more than four years. But it’s also fitting because the power considerations on this trip are huge. It’s not like we can plug into an outlet at 20,000 feet! I’ve been using a NOMAD 20 solar panel and a Sherpa 50 battery/AC inverter plus another generic 20,000mAH LiPo battery pack. We’ll have a backup Honda generator for emergency power at base camp. You’ll be able to follow my progress on my DeLorme site, and I’ll update you here along the way. I’m in Nepal for nearly two months, because, after Annapurna, if all goes well, we’ll fly across the Kaligandaki River valley and attempt Dhaulagiri. We will also be joined by a cook at base camp, as well as our old friend Lapka Sherpa and four other Sherpa. We could begin the ascent within a week once we arrive in Nepal. Mountain climbing is equal parts preparation, problem solving and will power. It is also a lovely excuse to travel and make amazing, passionate friends along the way. And each time we get more adept at kitting ourselves out, gear gets lighter and, in the case of electronics, more interesting and useful for climbers. These devices, inconceivable in the days of Sir Edmund Hillary, might turn out to be the difference between life and death up there. I’ve had some scary moments in 10 years climbing mountains, but more about that - and how our expedition and gear is faring - in subsequent blogs.